I love flowers. I absolutely adore flowering trees and bushes. If I had my way, my whole yard would be full of flowers. Two things stand in my way. First, I'm not much of a gardener, and second, my yard is practically all shade (which I am learning is NOT good for most flowers). However, we do have a few really lovely perennials. 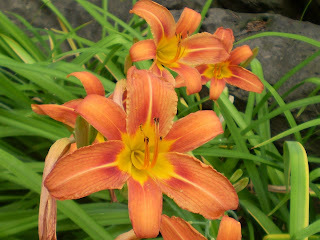 One of my favorites is the profusion of orange day lillies that runs across the front of our stone wall by the street. Every year I look forward to them. For the most part, I do not like flowers on my walls, though. We have some of the most hideous wallpaper in the 2nd bathroom. I can't imagine why anyone ever thought that 4" flowers in mauve, pink, blue and gold with giant green leaves would be attractive. So yesterday I decided I couldn't stand it anymore and started ripping it off. Ahhh, that feels good. It only took me five years to get around to it! Look at the lovely blue paint they covered up with that awful stuff (yes, they even covered the medicine cabinet in their enthusiasm)! Genevieve is mad at me, though. She doesn't like change, and assumes that anything with flowers on it must be pretty. I need to work on her sense of style.